There is a gap in the weather so we are going for ringing now at 9.15. Cameras will be off until the process is complete, full details will be posted later today. We have two girls and a boy and to most people's surprise, Bobby Bach turned out to be a female! 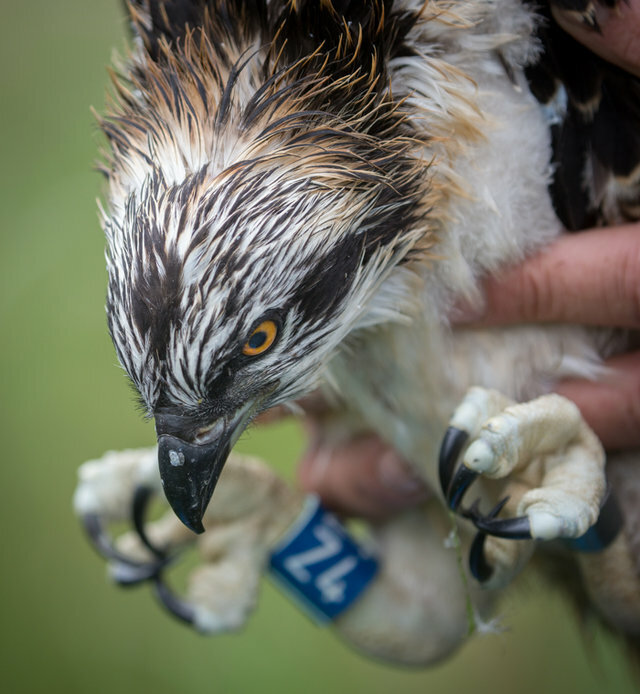 The first (oldest) chick was 37 days old today and he weighed 1,520g - right where you'd expect a male to be at. However, his two younger siblings, both weighing exactly the same, weighed almost 13% more at 1,710g. Great pics and great coverage, Ferenz!!! This morning, both juveniles were getting excitable at around 05:20, flapping and jumping around. What an exciting day! We have been expecting 2AN to take her first flight imminently, as she is seven and a half weeks old and has been showing signs of being ready to go for a few days. 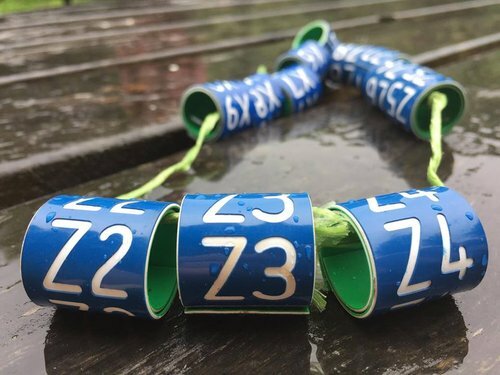 However, recently the weather hasn’t been conducive to fledging, as there has hardly been a drop of wind, and they need a breeze to excite them and give them a bit of a lift! 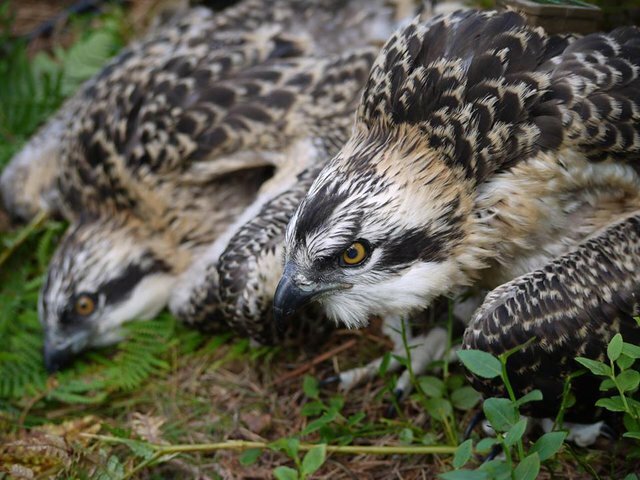 2AN fledged at 10:14 this morning, making her the first osprey to fledge from a UK nest this year! (That we know of!). We had a school group in the centre at the time and they were very excited, as were the staff and in particular volunteers Steve and Roger who saw her go from the hide! She didn’t give us very much warning that she was about to go – there was no helicoptering at all, she just jumped around the nest a few times, then she lifted up and away! The eldest osprey chick (PH2) fledged the nest this afternoon at 2.04pm. ever since – perhaps a little nervous to make the return journey! 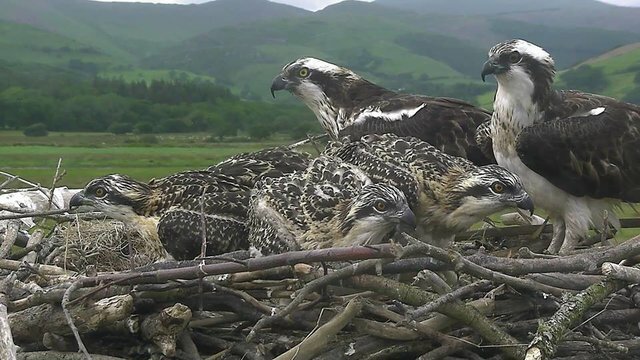 Dyfi, Wales: Menai has fledged. After threatening to jump off all day, Menai finally decided it was time to test her wings out in earnest at precisely 15:29. She didn't go far, just a hop really to the camera pole. Soon afterwards, however, she set of for a relatively long-haul flight of over two minutes, finally deciding to try and land on the anti-perch perch on top of the larch tree. She made it back to the nest soon afterwards with what can be described as a minor misjudgment. She soon untangled herself from the offending rail-twig into the sanctuary of the nest where a few minutes later Monty brought a mullet in for the whole family. 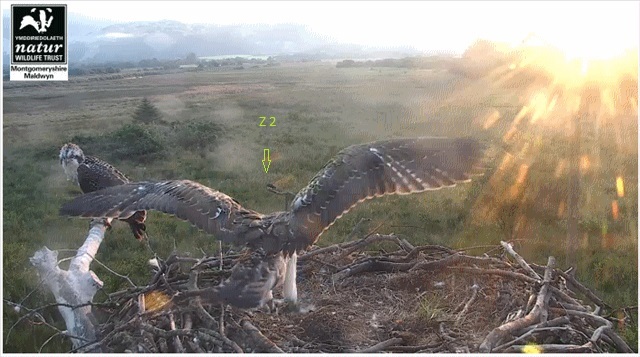 Dyfi, Wales: Eitha has fledged at 12:53, 18th July, she finally plucked up her courage and took the plunge - directly off the new nest perch. 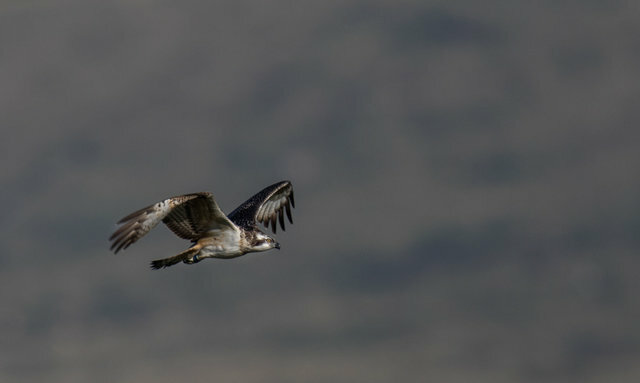 As happens with many fledglings, she initially went down, but soon reacted before ascending and continuing on for over three and a half minutes, soaring and flapping around the Dyfi as if she'd been doing it all her life. Can you just imagine what goes through a bird's mind during these first few seconds of flight? 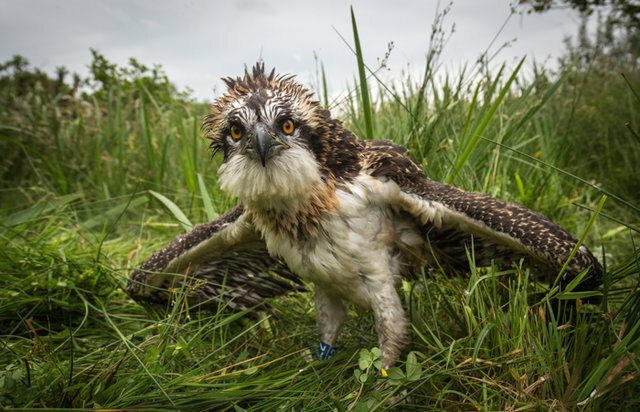 Eitha was 53 days old when she took her maiden flight, a day older than the Dyfi average for females. This was to be expected as Eitha is the largest of this year's offspring - she'd probably hit the scales at over 2Kgs at the moment. Larger birds tend to take a day or two longer to get airborne. 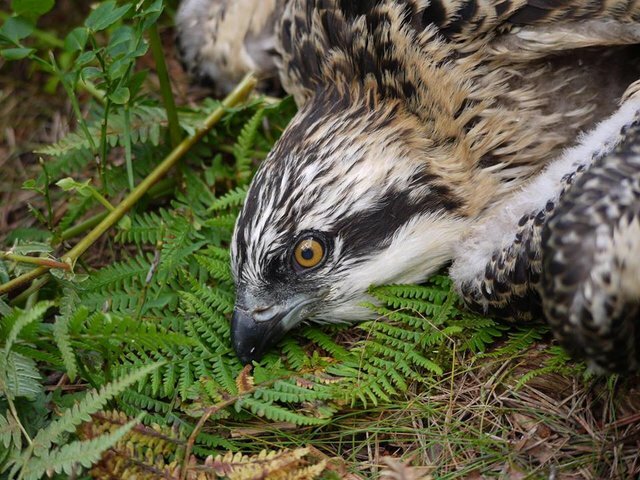 Aberfoyle, Scotland: The osprey chicks have now been ringed and returned to their nest - Clarach is back on the nest too after keeping watch from up in the air. 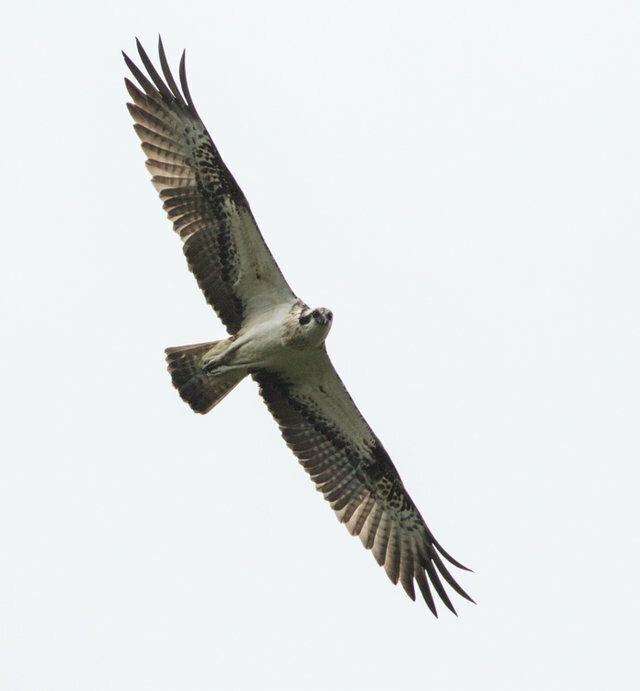 At one point we saw both adults and an intruder circling the area. 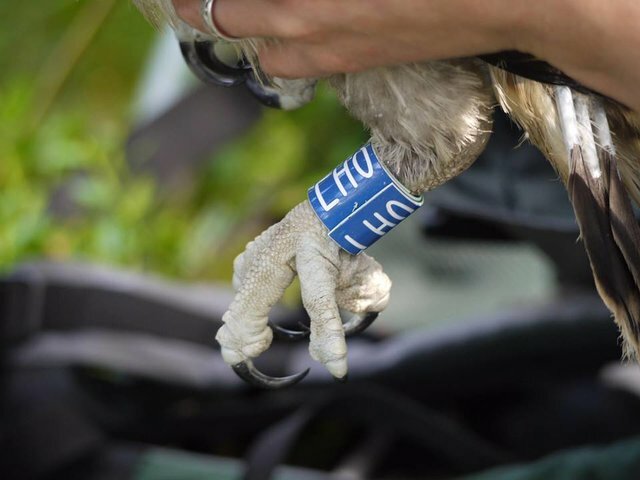 They are both male and have been given the darvic rings LH0 and LH1. LH0 has been satellite tagged and LH1 may be tagged later as was a wee bit too small. We should be able to keep track of their progress over the next few years.